Firstly, I designed the book cover for this novel and while that doesn't effect my overall review, I just wanted it to be clear. Secondly, The Demon Accords is probably my favourite series at the moment. They're fun, easy reading books that are so addictive that I have probably gone through the entire series up to 5 times already. Since I discovered this series just under three years ago, the latest Demon Accords novel is always on my must-read on the day of release list. 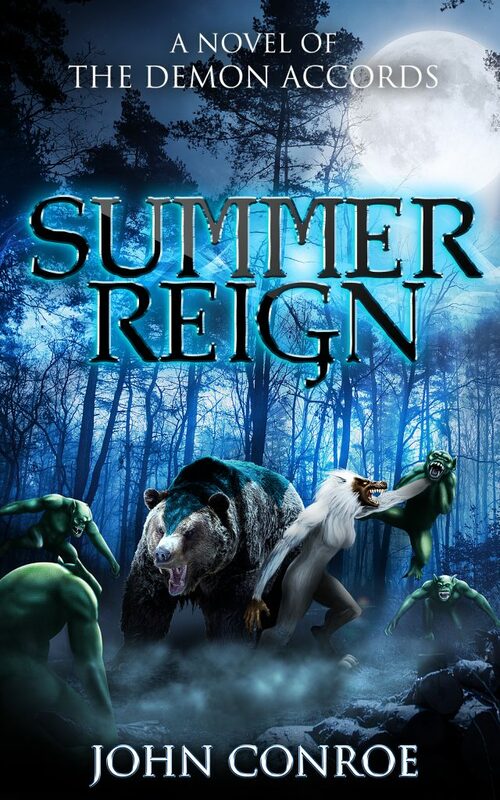 Summer Reign was no different. As always it is really good to jump back into this world, and I was really pleased that Declan was taking the lead on this one again. Don't get me wrong, I love stories from Chris' perspective just as much, but I have really been enjoying Declan's story of late. Unlike is normally the case with these books, I found that this one took a little while to find its feet. The opening 35-40% was enjoyable to be sure, but it lacked the usual pace and urgency that hooks you and gets you invested. I found myself enjoying being back in the world, but wasn't really drawn into the story quite yet. That all changes at about the 40% mark, and suddenly I couldn't put the book down. Without going into too much detail here, the real strength of this book is Declan as a character. His time in the spotlight has very much been a coming of age story where Declan is coming into his power as the junior member of the team. After the events of Winterfall, the time for growing up has long since passed and he is now well and truly a major player. That's not to say he's not having fun at college and all that, but he is firmly in the big league alongside Chris and Tanya now, and he is starting to see the fallout from playing at such a high level. As with the infamous Spider-man line, this is the book that really shows Declan that with great power comes great responsibility. He must learn that not only do actions have consequences, but when Declan acts, his actions have bigger consequences than most. The conflict that comes from this created real stakes for Declan where they might have been missing before. A lot of criticism for overpowered characters, like Superman, is that because they are so overpowered, there are no stakes and they're therefore impossible to write. I have always disagreed with this statement because I feel such criticism lacks imagination and thinks only in terms of physical stakes, and this book proves it. Yes, Declan and Chris have impossible powers and it's hard to believe they could ever lose a fight. But by focusing on the character themselves, making their own internal struggles deeper and creating vulnerability that way, you can come up with some seriously good storytelling as was done here. So in spite of that slightly slow start for the first third of the book, the rest of the novel just kept getting stronger with every chapter. The last third of the book especially was more than good enough for me to rate this book 9 out of 10, just shy of the usual 10 star rating for the books in this brilliant series. Once again I burned through a Demon Accords novel in a single sitting, and already I can't wait to see what's coming next.